This beautifully-modelled mystery is one of a series of 10 showing the embryonic development of the crayfish Astacus astacus. 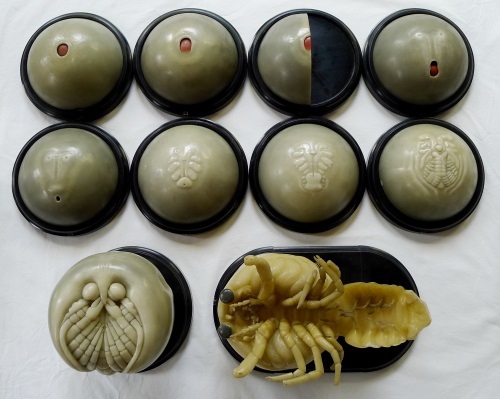 These wax models were made in 1891 by Paul Loth of the Institute for Scientific Wax Image Moulding in Leipzig. 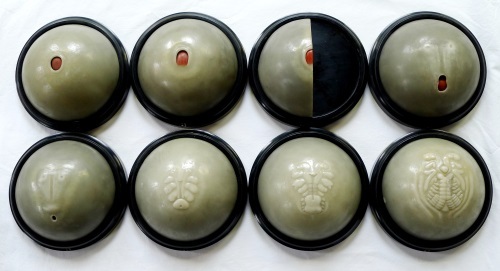 Wax models of embryos were, by the end of the 19th century, used widely as teaching aides in university biology and zoology departments. 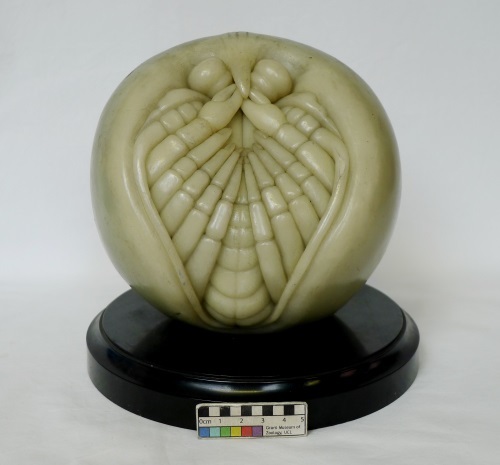 It was also the the golden age of crustacean embryological studies and these models were based on the leading research of the day – in this case, Ludwig Reichenbach’s studies of the anatomy and developmental stages of crayfish from the 1870’s and 1880’s. Throughout the years, many developmental studies of crayfish have focussed on the number of stages from spawned egg to hatchling based on external morphological characters ranging from 5 (Rathke 1829) to 15 (Zehnder 1934). Loth’s models after Reichenbach depict 10 stages charting the development within the egg from the beginning of gastrulation to hatchling. Depicted in the first 8 models are the formation of the body parts as they progressively occur: the naupliar segment (this will become the first free-swimming larval stage after hatching), the optical lobes, first and second antennae, mandibles and pereiopods (the walking legs). The ninth model, the prehatchling, shows the segments completely differentiated and the embryo about to burst out of the egg. The tenth model shows the aftermath of the hatching event. 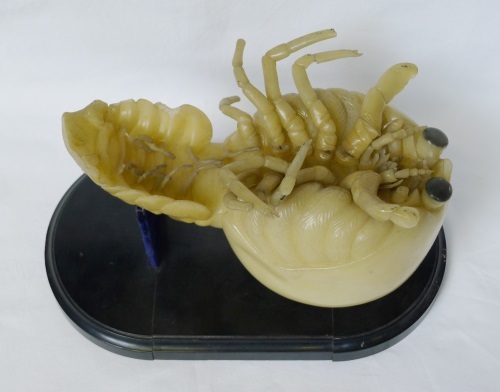 There is no denying the that the last model in this series – the hatchling – looks very facehugger-like. 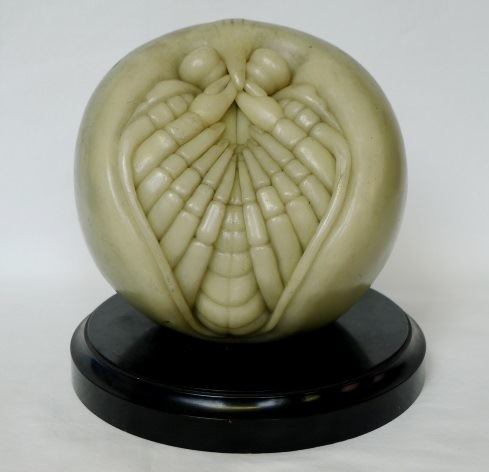 However, it is the wondrous ambiguity and sense of imminent rupture of the ‘ball of astacus embryo’ which serves as a chilling reminder of the atmosphere of creeping terror in the film as well as the alien itself. Crayfish, much like how the film creature is described, are survivors. They belong to the order Decapoda (which includes includes lobsters, crabs, shrimps, krill and barnacles) in the subphylum Crustacea – an ancient group which arose in the early Cambrian Period 541 million years ago. Crustaceans have a rich fossil record with the oldest decapod fossil (Aciculopoda) dating from 360 million years ago and the earliest crayfish fossil at 115 million years old (Emory University). Rathke, H. 1829. Untersuchungen über die Bildung und Entwicklung des Flusskrebses. Voss, Leipzig. Reichenbach, H. 1877. Die Embryonalentwicklung und erste Entwicklung des Flusskrebses. Zeitsch. wiss. Zool., 29: 123-196. Reichenbach, H. 1888. Zur Embryonalentwicklung des Fluβkrebses. Abh Senckenb Naturforsch Ges 14:1–137. * Alien (1979) Directed by Ridley Scott [Film]. UK/USA: 20th Century Fox.